In expectation of the most important conference for the Belgian photovoltaic market The Solar Future: Belgium 2012 which will take place at the end of march in Brussels. Peter J. Segaar analyzed for Solarplaza the last years (www.solarplaza.com). 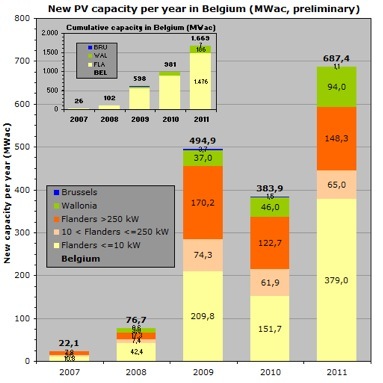 In his overview he pointed out that 2011 Belgium’s PV market beat the previous record year 2009: 687 MW*. And volumes may increase with new reports. In contrast to fears that the PV market in Belgium would be negatively impacted by a series of green certificate value digressions in Flanders, the year saw the installation of a large number of PV modules. According to present data, so Peter J. Segaar, Belgium had accumulated 1.669 MW end of 2011, with shares larger than 88% for Flanders, over 11% for Wallonia, and 0,4% for Brussels – with more volume yet to be added. Taking a conservative ratio (DC:AC = 1,1:1), 1.836 MWp PV generator capacity could already have accumulated. Thus, an average 167 Wp PV module could have been installed for each of Belgium’s 11 million inhabitants (EU27 average 2010: 59 Wp). In 2010, 595 GWh of solar electricity was generated in Flanders, while a preliminary 1,2 TWh has been registered for 2011. During the freezing mid-winter conditions, as at January 27, 2012, between 4 and 8 percent of Belgium’s electricity consumption was covered by photovoltaic conversion of sunlight during the day. Although green certificate value for PV projects larger than 250 kW has now dwindled to 90 Euros in Flanders, and large projects seem to have come to a standstill, the residential and commercial sector still look promising, with low module prices. How much volume that will generate in the crisis year 2012 is hard to predict. For more information on the event and registration for the conference, please visit www.thesolarfuture.be . Log in | 76 queries. 0.987 seconds.